The Salem witch trials stand as one of the infamous moments in colonial American history. More than 150 people -- primarily women -- from 24 communities were charged with witchcraft; 19 were hanged and others died in prison. 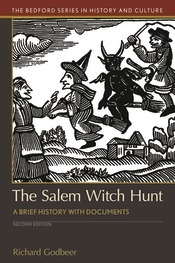 This second edition continues to explore the beliefs, fears, and historical context that fueled the witch panic of 1692. In his revised introduction, Richard Godbeer offers coverage of the convulsive ergotism thesis advanced in the 1970s and a discussion of new scholarship on men who were accused of witchcraft for explicitly gendered reasons. The documents in this volume illuminate how the Puritans' worldview led them to seek a supernatural explanation for the problems vexing their community. Presented as case studies, the carefully chosen records from several specific trials offer a clear picture of the gender norms and social tensions that underlie the witchcraft accusations. New to this edition are records from the trial of Samuel Wardwell, a fortune-teller or "cunning man" whose apparent expertise made him vulnerable to suspicions of witchcraft. The book’s final documents cover recantations of confessions, the aftermath of the witch hunt, and statements of regret. A chronology of the witchcraft crisis, questions for consideration, and a selected bibliography round out the book's pedagogical support.